Down by the riverside in Maribyrnong a beautiful glass-fronted restaurant was built and then sat empty for a few years. We cycled and strolled past there from time to time, and wondered when it would ever open. Well, now it has. The Degani cafe empire have taken over this place, and it opened just a few days ago. We noticed the open door on our way to Cafe Boutique, and diverted there for a late breakfast. 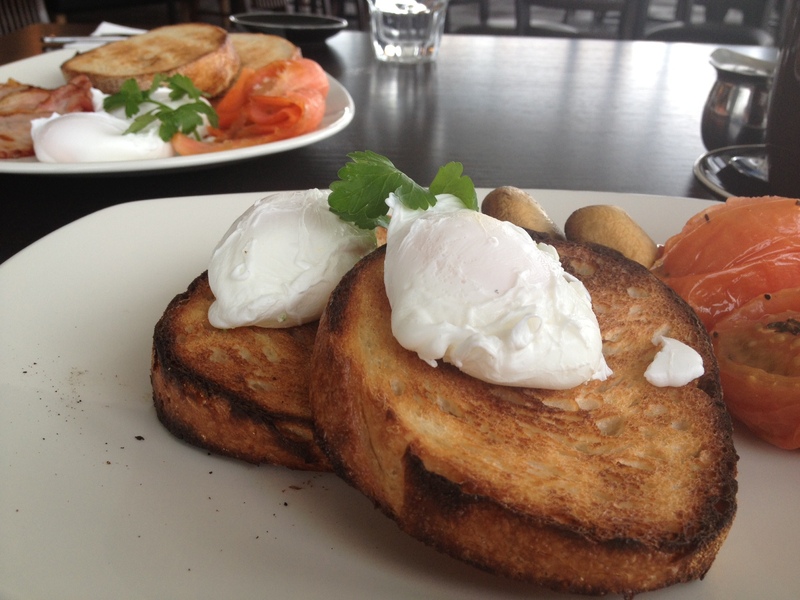 The restaurant is light and airy, with a full glass front overlooking the Maribyrnong River. This is going to be a great haunt for a cheeky afternoon drink in the summer, or a cosy coffee and cake on cooler days. The space is not overloaded with tables which is nice for a change. There is a stunning outside space with high stools and cafe tables – guaranteed to become a favourite spot on sunny days. In the centre of the restaurant are a couple of banquettes and larger tables seating up to 12 or so people, but I’m sure they would configure some of the smaller tables to accommodate larger groups right by the panoramic windows. The only decor points lost were for the two large TV screens, one showing the football and the other MTV. I’m not a fan of TVs in restaurants, and although I understand they will be handy to attract punters for the occasional big game I’d prefer if they were kept switched off the rest of the time. To the food: the menu is a decent bistro mix of steak sandwiches, parmas, fish and chips, lamb shanks. You know the drill. They also have a pizza menu but I shall reserve judgement on those until I taste them. Actually, the whole menu reminded me very much of the newly-renovated Plough Hotel, another great new local eatery. Breakfast was (mostly) generously-proportioned, tasty and good value at $41 for two. My side of mushrooms consisted of just two mushrooms which I thought rather miserly, however O’s bacon and smoked salmon more than made up for this slip. Tea is served in large mugs (good) made with decent tea in bags (good) however no teapots are to be had (bad). Given the fancy-schmancy coffee machine behind the counter, I fear this cafe focuses on coffee heads and forget the tea drinkers, like so many places in Melbourne. If you are reading this, Degani’s, please buy a few decent-sized teapots for your regulars – we will thank you! Service was friendly without being over-familiar, and the occasional hesitation was forgiven in place open only two or three days. The neighbouring Cafe Boutique is fine, and will remain on our standby list, but in just one visit I think the Lakehouse has just become our regular Sunday destination. I am looking forward to coming back of an evening to try out their dinner menu.